Cambridge, MA (December 3, 2014) — Kathy Connelly and Betsy Steiner, two of the biggest names in U.S. dressage, will launch their Nutrena/USDF Adult Clinic Series, “How to Develop a Winning Program and Partnership with Your Horse,” at the 2014 Adequan/USDF Convention held Dec. 3-6 in historic Cambridge, Mass. 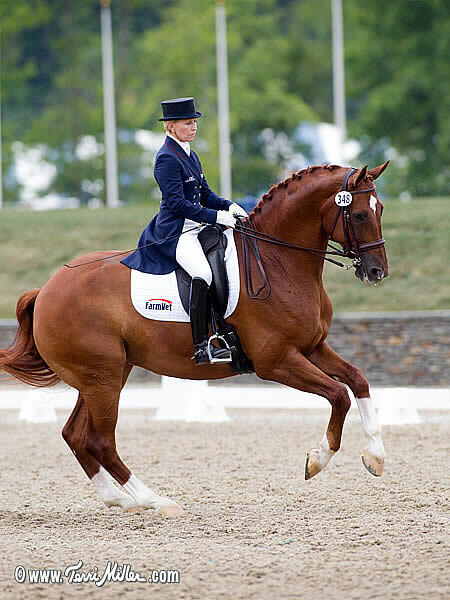 The dressage icons will co-instruct the series, which will be held in each of the nine USDF regions and will run from the spring of 2015 through 2016. They will conduct five clinics aimed at the adult amateur in 2015 and four the following year. Eight riders chosen from a pool of diverse equestrians of all levels will participate in each clinic. Riders and auditors will benefit from the attention of both of the instructors as they take turns helping the riders and interacting with the attendees during the two-day clinics. The duo will present their kick-off to the series at 1 p.m. on Saturday, Dec. 6 at the host hotel for the USDF convention, the Hyatt Regency Cambridge. Connelly is a respected international trainer, coach, clinician and “S” judge and has excelled in the international show ring. She competed as a United States Equestrian Team Rider at the World Cup in Sweden and as the highest placed Grand Prix rider on the U.S. Bronze Medal Team at the North American Championships. She is the Vice Chairman of the USEF High Performance Dressage Committee, and was a U.S. Team selector for the 2012 London Olympics and 2014 World Equestrian Games. She is a popular commentator, having served at the 2010 World Equestrian Games, the 2013 USDF Dressage Finals and recently at the 2014 USDF Dressage Finals in Lexington, KY, providing expert analysis to the live-feed for the event. Steiner is also an international dressage trainer, coach and clinician. She represented the U.S. at the World Equestrian Games in Sweden and is an accomplished commentator, having provided her expertise for the 1995 World Cup of Dressage, the 1996 Olympic Games and, most recently, the 2014 World Equestrian Games Trials in Gladstone, NJ. She said that she and Steiner individualize their instruction for the clinics according to what the rider tells them about their present situation and they use that information to build upon. She added that their goal is produce a top educational experience with clearly presented material for both riders and auditors. Both Connelly and Steiner share a belief in using a calm approach to teaching and they believe it’s important to help the horse and rider develop a partnership. To learn more about the Nutrena/USDF Adult Clinic Series, click here: http://www.usdf.org/education/clinics/adult/index.asp. To get more information about the Adequan/USDF Convention, go to https://www.usdf.org/convention/. For more information about Kathy Connelly and her impressive dressage background, email kathyconnellyavf@aol.com or call 978-486-8674. Wellington, FL (March 9, 2011) – Dressage rider and trainer Betsy Steiner, who represented the United States at the World Equestrian Games in Sweden, competed Joli Burrell’s Fino at the Palm Beach Dressage Derby at White Fences in Wellington and said the secret to each and every ride she takes is the simple fact the she loves her horses and competing. 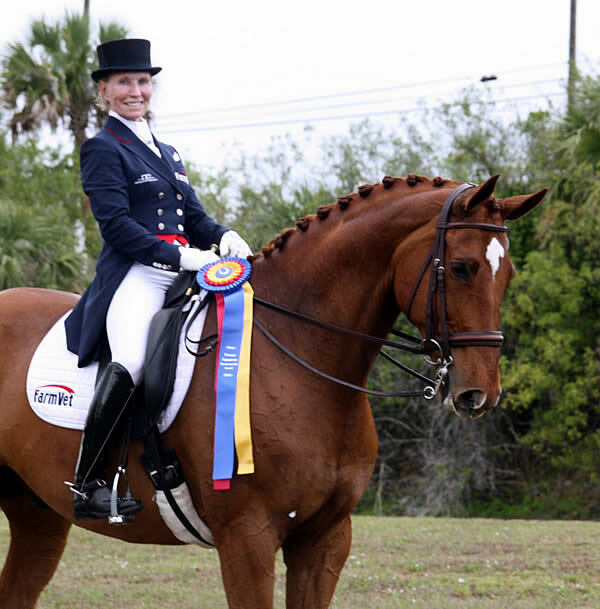 In addition to enjoying her ride, Steiner was awarded the Premier Sportsmanship Award, sponsored by Premier Equestrian, a leading supplier of dressage arenas, horse jumps, arena footing and stable accessories. The Premier Sportsmanship Award is awarded to a rider who displays a high level of sportsmanship during a show and Steiner thanked Premier for the award. “The award really encourages riders and it makes you feel good about coming to the show and doing well,” she said. Steiner added that she was really pleased with Fino’s performance at the show. “He was a great boy and I was really happy with him. It was the first time I’ve had him in the ring since June and he really came through for me,” she said, adding that she competed Fino in the FEI Test of Choice Prix St. Georges class. When asked how she maintains a great level of sportsmanship, Steiner said she loves competing. “I love all of the horses I compete and Fino just happens to be one of the best,” Steiner said. 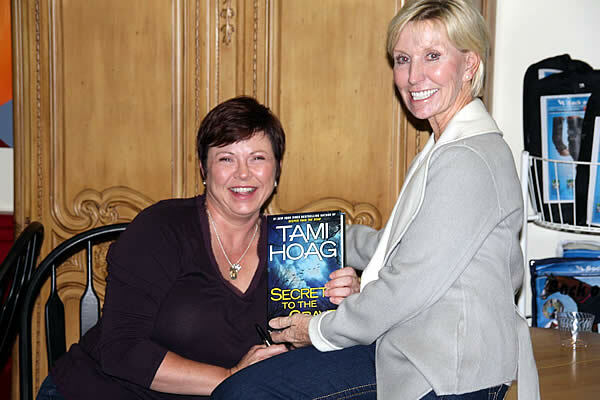 Wellington, FL (January 18, 2011) – Dressage rider and New York Times bestselling author Tami Hoag knows how to write a spine-tingling murder mystery and she also knows how to bring in a standing-room only crowd when unveiling a new novel. Hoag did just that recently, when she unveiled her newest novel Secrets to the Grave to the Wellington horse community while on a book tour that had her stopping at the Wellington dressage boutique Sho Clothes and their monthly “Shop Talk” gathering. Hoag, who has 15 New York Times bestsellers to her name, shared the secrets behind Secrets to the Grave and also signed her novels after her talk. While Hoag has fans all over the world, she makes her home in Wellington and is well known in the equestrian community as both a writer and a rider.